Aaron Hernandez is currently indicted for three murders. 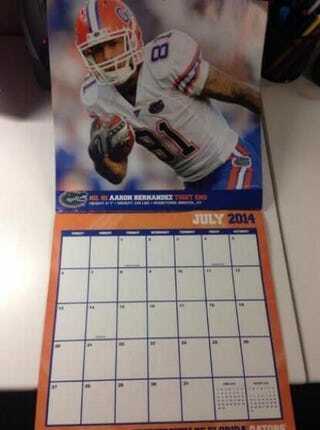 The former New England Patriots star is also the 2014 University of Florida sports calendar's "Mr. July," the Associated Press reports. According to the news site, school officials on Tuesday said the calendar was approved last spring before Hernandez's shocking June 2013 arrest in the murder of Odin Lloyd, a linebacker for the Boston Bandits. Hernandez has since been indicted for a 2012 Boston double homicide. The school's spokesman, Daniel Apple, told AP that the calendar was made by a third party and that since it has already been printed and distributed, there's little that can be done at this point. "There are thousands of Gators products for approval in the pipeline at any given moment," he said, adding that the issue was brought to the university's attention on Monday.